Tête à Tête: The Opera Festival 2013 put a call out to anyone who wanted to experiment with writing extended vocal techniques to submit their works to Jane’s Contemporary Clinic. – Pieces, excerpts or fragments for solo soprano or soprano and piano. Short is good: time is limited! – Normal lyric soprano range (not above high C) but with low extension to G below treble clef. – Be aware that very complex notation systems and an abundance of unfamiliar symbols will render the piece unsuitable for this clinic. – Be aware that this clinic is primarily to discuss vocal writing and extended techniques rather than work on complex ensemble problems. – As Jane will be utilising her legendary sight reading skills, please make sure that your score is exceptionally clear and not too small! – Pay attention especially to the readability of the text and its placement to get the most out of this marvellous opportunity. 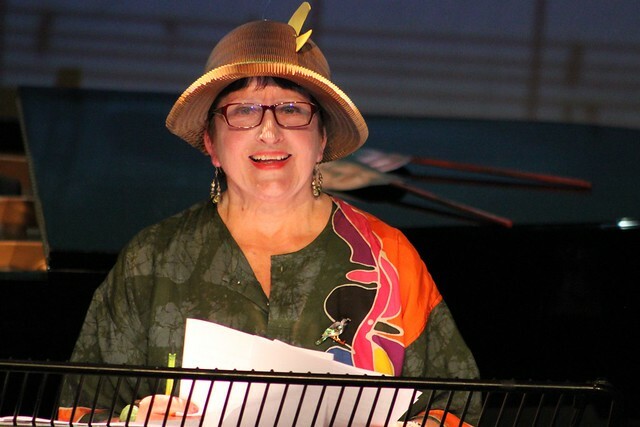 Join contemporary singing’s most youthful and glamorous doyenne, Jane Manning OBE, as she celebrates her 75th birthday and the final day of Tête à Tête: The Opera Festival 2013 by sight reading and discussing a selection of brand new works in collaboration with Lite Bite MD James Young. Jane Manning has made a career unique amongst classical singers, producing definitive recordings of seminal repertoire – notably Schoenberg’s Pierrot Lunaire, writing essential books on vocal repertory including the latest work Voicing Pierrot, tirelessly supporting young artists and composers, creating a body of over 350 new vocal works, and conducting an intense performing schedule for nearly half a century while establishing herself as one of the best loved figures in British contemporary music. Jane was awarded the OBE in 1990. Famed for her unparalleled facility and accuracy in the most demanding of music allied to a complete commitment to its emotional content, Jane is one of the great performers of our time. Royal College of Music-trained pianist, composer and conductor James Young has fulfilled commissions from the Park Lane Group, European Union Chamber Orchestra, Phoenix Piano Trio and harpist Keziah Thomas – Varying Rule Britannia (for solo harp) has just been released on an album entitled Crossing Waves by Discovery Records. He performs as a pianist regularly at major venues such as Wigmore Hall and Purcell Room, working with artists including Jane Manning, Roger Heaton and the O Duo. He is also a member of Piano Circus and creates experimental and improvised theatre – including Six Word Operas at Tête à Tête: The Opera Festival and Event 001 with Neil Georgeson at the Rosemary Branch Theatre. He is also Music Director for Third Hand Opera and Tête à Tête: The Opera Festival’s Pop Up Operas. His first opera, Njogel – written with librettist Neil Georgeson for Third Hand – premiered at Tête à Tête: The Opera Festival 2014 last weekend.